These folks rolled through Kansas City this week. 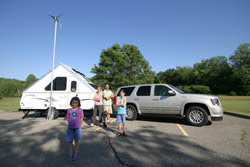 They are driving a Chevy Tahoe Hybrid and are using alternate energy sources to power their camper. Are you doing anything to go green this summer? Hmm, not doing anything that I haven't already been doing for years. We are conservationists Barbara.. not sure that we are green ones though?